The tournament has only just started for the top seeds so there's not much to report on as yet. Here's a pre-tournament interview with Rafa from the ATPWorldTour site. Here is part of the pre-tournament press conference from the FastScripts Transcript by ASAP Sports. Q. You're obviously motivated for every tournament, but this one you haven't won. It's one of the few places. Does that give you extra motivation? You'd like to notch one more tournament you haven't won before? RAFAEL NADAL: Yeah, sure, I would love to win here any year, but it will be not fair if I say yes. I would be lying to you. When I am playing a tournament, I always try my best in every one. So when I go on court, I try my best in every tournament, in every match. I gonna do it the same here, no? Hopefully I will have a good few days. I hope to be competitive tomorrow. Never is easy the first round, especially when you play an opponent like Lleyton, and especially when he already played a match, so it will be tough battle. I need to be very competitive. I need to be ready. I hope I will be, you know, but we will see. Q. Is it a little different playing in Miami than other parts of the you States because people are in the stands with Spanish flags, people are speaking Spanish, and you have a lot of fans here? RAFAEL NADAL: Yes, you know, is it different because there are a lot of Latinos here, so that makes the tournament a little more special for us. But I really feel the love of the people in a lot of places here in Miami, almost in every one that I played. So I cannot say nothing bad with Cincinnati, with Indian Wells‑‑ especially Indian Wells. I love it. And for sure in the US Open. So I feel, you know, really loved from the people of America. So nothing to say against that, no? I really enjoy a lot playing here in America, but is true with all the Latin communities, it's really special. Q. Describe the feeling of what it's like to compete against Lleyton Hewitt, and does he remind you of yourself more than anybody else in terms of a competitive spirit? 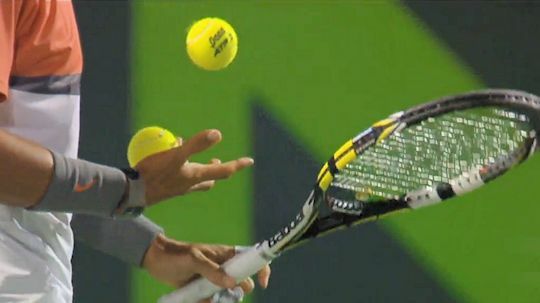 RAFAEL NADAL: Well, I don't know about that. I think he's a great inspiration for a lot of players after winning a lot of things as he did, and having a lot of physical problems he's able to keep competing with unbelievable spirit, great motivation. He's able to come back after important injuries. So that's a great example for the rest of the players. I am happy to see him playing well again. Hopefully not tomorrow (smiling). But, yeah, he already won a tournament this year, so it will be a tough match for me. I need to play well. I'm going to try. Q. Another question about Lleyton. Does it help in a way to have an opening match where it's against a high‑profile player who is very fired up and excited after his win yesterday? Does it give you more motivation than when you're playing in an opening match that it's going to be so competitive and exciting against a fan favorite and so on? RAFAEL NADAL: I prefer an easier opponent (smiling). But that's what there is. I cannot choose the draw. Gonna be tough one. But at the same time, he's a player that you can play‑‑ we are gonna play rallies from the baseline. Gonna be a hard one. But the good thing of playing these kind of matches is that if you are able to win, you will be in rhythm for the tournament. Against the players that I played last week, Stepanek or Dolgopolov, even if you win, you feel that you are not playing the point the way you want to play. So different history. The good thing is if I am able to play a good match tomorrow and win, probably I will be confident and on rhythm. Q. You played Lleyton a lot in the past. Is he somebody you like and enjoy to play? And if so, what is it you like about facing him? 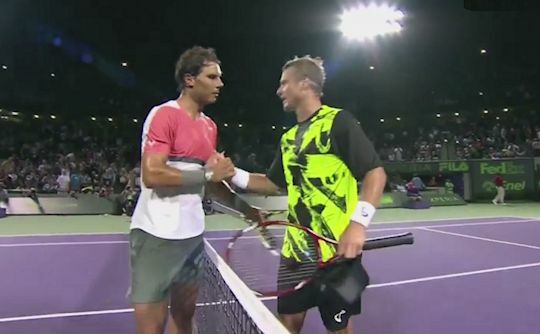 RAFAEL NADAL: I admire him when I was a kid and I saw him on the TV. I like his character. He always fighting for every ball. He always give everything on court. He's a good example of how to fight in the tennis court. For sure when I was younger I remember very good battles against him. In Australia I lost twice, but won in three very close sets and another one in five sets. It was great memories, and especially playing at his home. So I always have good memories of the matches against him, and will be tomorrow another one. We've only had one match so far. Predictably, it was a night match. Of course, it didn't start until a good couple of hours past its "not before" time of 8pm. Luckily for those of us trying to keep awake in different time zones, Rafa didn't waste time dispatching Lleyton Hewitt in straight sets, 6-1, 6-3. Rafa was playing much more aggressively, right up on the baseline. There were some amazing rallies, with Rafa tending to come out on top most of the time. 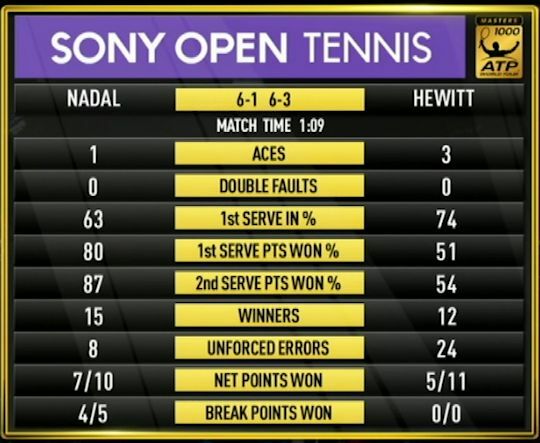 The match statistics tell the story. I will end on a gratuitous shirtless picture. Hopefully, the first of many in this tournament.